PiCture pOlish's Blog Fest has been going on for a few years now, but this is the first time I'm actually participating. I was so thrilled when I received an email from piCture pOlish inviting me to take part in this year's Blog Fest! 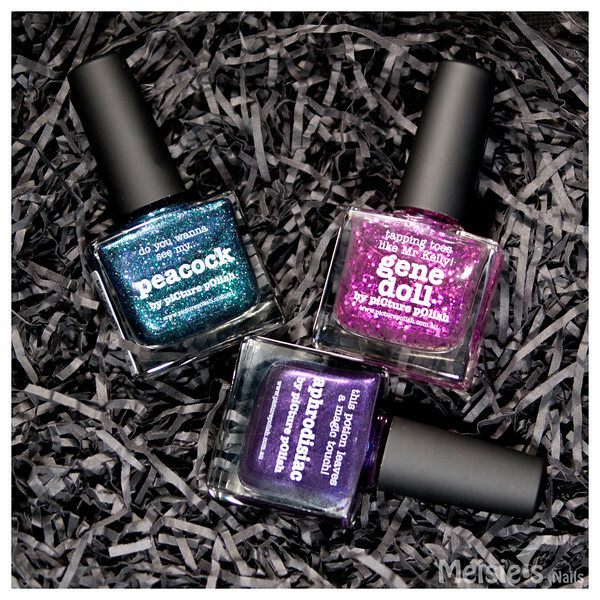 The 3 piCture pOlish shades that were provided to me are: Peacock, Gene Doll and Aphrodisiac. They are all gorgeous! Don't you agree? Peacock is part of the Opulence Collection released in 2012. It has a deep blue-toned purple jelly base with tons of irregular-shaped blue-green glitter. Aphrodisiac is a dark purple shade with a very nice subtle shimmer. 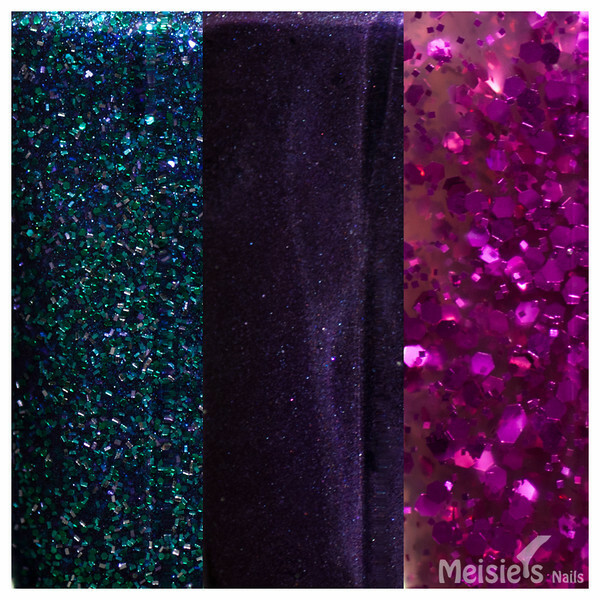 Gene Doll has a clear base with different sizes and shapes of magenta glitter. I had this drip design in mind from the moment I received the 3 shades from piCture pOlish. I really like how it turned out and I'd like to share a tutorial on how to create this same drip design. 1. Paint your nails with any white polish and let it dry. 2. Draw the drip outlines with black acrylic paint or black nail polish using a liner brush. 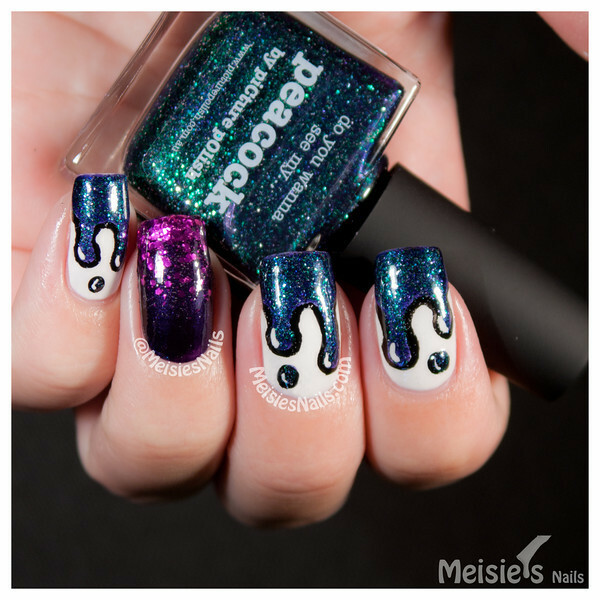 If you feel comfortable using the nail polish brush, you can just skip this step and add the drips with piCture pOlish Peacock directly over the white polish. 3. 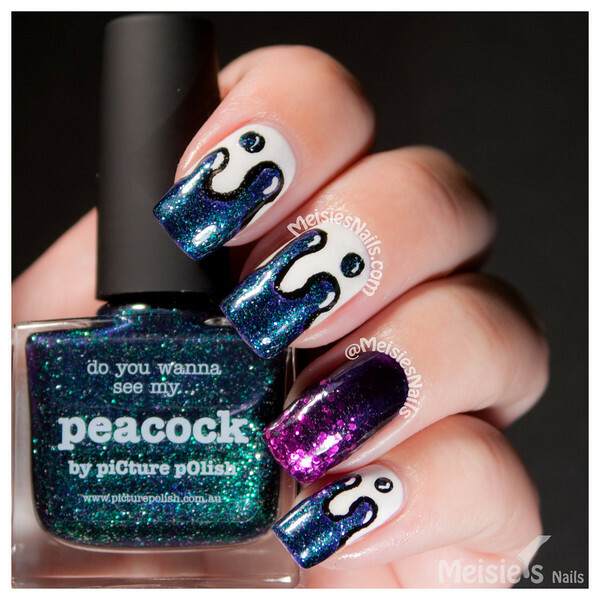 Now fill in the upper part of your nails (above the drip outline) with piCture pOlish Peacock. 4. Apply a second coat of Peacock and add a small dot just below your drip using a dotting tool or the nail polish brush itself. 5. Paint some "reflection" on the drips with white acrylic paint or white nail polish using a liner brush. 6. Let it all dry and apply top coat to seal in your design. You're done! 1. Paint your nail with PiCture pOlish Aphrodisiac and allow it to completely dry. 2. Apply piCture pOlish Gene Doll directly onto a sponge. It can be a makeup sponge or a simple kitchen sponge. 3. Dab the sponge on your nail, starting from the tip and working it's way to the base of the nail. Repeat this process until you achieve the desired gradient. 4. Once you're satisfied with your gradient, apply top coat and that's it! I hope you like this design! You can order these and all the other shades directly from piCture pOlish. They do offer International shipping, but please take note of their shipping policy as some restrictions may apply. Don't forget to check piCture pOlish's Every Day Deals! You can also purchase piCture pOlish shades through their network of retailers.